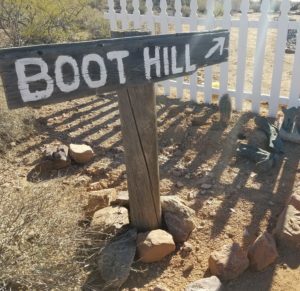 As much as we joke about going to Boot Hill someday or tell stories about St. Peter guarding the gates of heaven, when death comes for a loved one, it’s no laughing matter. It’s been a long winter for our family. In October, my 58-year-old niece died unexpectedly. No one should die before their life’s work is complete. In January, my husband’s sister died after two lengthy illnesses. Thirty days later, another sister’s husband died. He was my age. The slippery slope of declining health had already changed family dynamics. It’s been years since we all packed up our kids and went to the river for a day of grilled burgers and raucous water fights. It’s even been a long time since we’ve spent a big, noisy Christmas together. The deaths still hurt. With each goodbye, we try to imagine what happens when we die. We wonder, what is heaven like? Will we see our loved ones again? How can we know for certain what happens when we die? The answer to these questions is Easter! Easter is the most important and oldest festival of the Christian Church, celebrating the resurrection of Jesus Christ. It separates Christianity from every other religion. Other beliefs teach that we must work our way to heaven, but Christians believe Jesus did the work for us. Sadly, many people believe in God and try to lead good lives, but they miss this truth. They don’t know where they will spend eternity. But we can know, and when we understand what Jesus did for us, that truth will fill us with hope and joy. Believe that Jesus carried our sins to the cross. Humbly admit that you can’t save yourself. Accept his free gift of salvation. The days leading up to Easter are a wonderful time for soul searching. We clean our houses in anticipation of the holiday. Why not also get rid of our lingering doubts about what happens when we die? Take God’s Word to heart. The movie, “I Can Only Imagine” just opened. This is a powerful true story of singer songwriter Bart Millard of the band, MercyMe. The movie had me gripping the arm of my seat and stuffing back tears, as well as laughing. 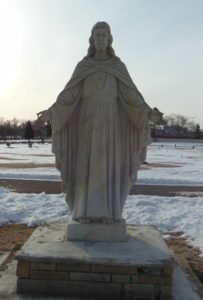 The movie is based on the song “I Can Only Imagine,” the best-selling Christian song of all time. 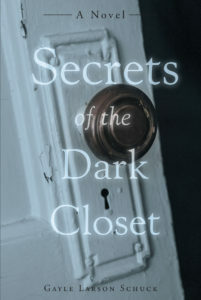 Speaking of Easter, one of my favorite chapters in Secrets of the Dark Closet is the family’s Easter in 1899. Get your copy online, or send me an email to obtain a signed copy. 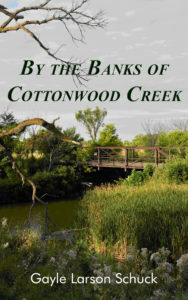 I’m working on the sequel to By the Banks of Cottonwood Creek and the characters have become very real to me. This morning I admired a friend’s cape and told her that Amber just bought a cape. Fortunately, my friend has read Cottonwood and knows Amber.